To investigate whether the combination of anastrozole and Tualang honey (T honey) influences background parenchymal enhancement (BPE) in breast magnetic resonance imaging (MRI) of postmenopausal women with breast cancer. A total of 30 patients were recruited and randomly divided into control (anastrozole 1 mg daily) and intervention (anastrozole 1 mg + T honey 20 g daily). The BPE of the contralateral breast before and six months following treatment was compared using the sign test. There was a decrease in BPE in 10% of the women (p = 0.317) who received only anastrozole, which resulted in a change of BPE category from moderate to mild. However, the combination of anastrozole and T honey evoked a decrease in BPE in 42% of the patients (p = 0.034). The combination of T honey and anastrozole maybe more efficacious than anastrozole alone in decreasing breast BPE in breast cancer patients. These findings support the medicinal value of T honey as an adjuvant treatment to anastrozole. Royal jelly is the queen-maker for the honey bee Apis mellifera, and has cross-species effects on longevity, fertility, and regeneration in mammals. Despite this knowledge, how royal jelly or its components exert their myriad effects has remained poorly understood. 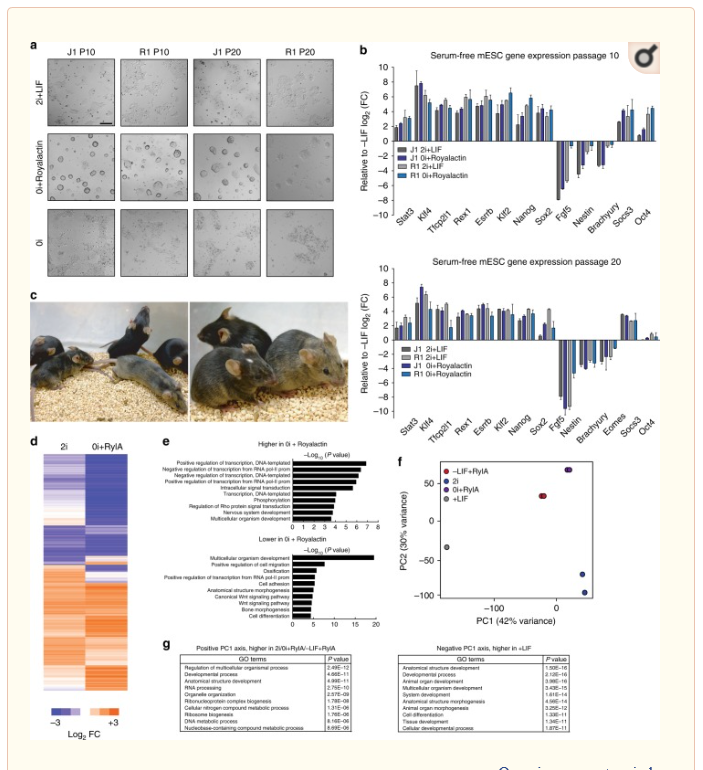 Using mouse embryonic stem cells as a platform, here we report that through its major protein component Royalactin, royal jelly can maintain pluripotency by activating a ground-state pluripotency-like gene network. We further identify Regina, a mammalian structural analog of Royalactin that also induces a naive-like state in mouse embryonic stem cells. 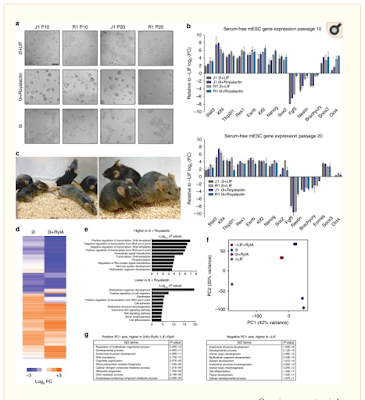 This reveals an important innate program for stem cell self-renewal with broad implications in understanding the molecular regulation of stem cell fate across species. Background: Although tyrosine kinase inhibitors (TKIs) are still recommended as the standard therapy in renal cell carcinoma (RCC), the high frequency of adverse events is a weakness of this therapy. Because royal jelly (RJ) possesses anti-inflammatory and antioxidant properties, we assessed its protective effects on TKI-induced toxicities in RCC patients. Methods: We enrolled 33 patients with advanced RCC who were assigned to start TKI therapy in combination with a randomized, double-blinded, placebo-controlled RJ trial consisting of a placebo group with 17 subjects and an RJ group with 16 subjects. Results: Fatigue and anorexia frequencies in the RJ group were significantly lower than in the placebo group (p = 0.003 and 0.015, respectively). A statistically significant correlation between RJ and fatigue or anorexia was detected in sunitinib-treated patients. The dose reduction- or discontinuation-free periods were significantly longer (p = 0.013) in the RJ group than in the placebo group. Furthermore, similar observations were made in sunitinib-treated patients (p = 0.016). Conclusions: Our clinical trial showed that RJ exerted protective effects against TKI-induced fatigue and anorexia and lowered TKI dose reduction or discontinuation. Hence, RJ is beneficial for maintaining the quality of life and medication compliance in TKI-treated RCC patients. To assess different effects of royal Jelly in protecting the human endothelial cells from high glucose level, human umbilical vein endothelial cells were exposed to various concentrations of royal jelly, from 0.625 to 10 mg/mL, at the presence of 5 and 30 mM glucose contents over a course of 72 h.
In addition to cell viability assessment by conventional MTT assay, we also analyzed the feature of stemness by expression of Sox-2 and CD133 factors. Moreover, fatty acid profile, the expression of autophagy-related factor, namely microtubule-associated protein light chain 3 and activity of metalloproteinase 2 and 9 and were investigated. Royal jelly supplementation at the concentrations lower than 2.5 mg/mL did not influence the survival rate of cells and partially blunted the cytotoxic effects of 30 mM glucose. The expression of CD133 and Sox-2 factors were increased by royal jelly alone. Interestingly, an up-regulated expression of Sox-2 (58.8 ± 4%) coincided with a reduction in the levels of CD133 (15.1 ± 8.3%) in the combined treatment. We notified that the contents of palmitate and trans-palmitate as well as linoleate decreased by 30 mM glucose content while cis-palmitate levels increased when RJ returned them to near-normal levels (p < 0.05). The expression of autophagy marker was prominently induced in the presence of royal jelly in both conditions (p < 0.05). The glucose-induced activity of metalloproteinases was also reduced. Royal jelly is able to attenuate the abnormal status of 30 mM glucose condition in endothelial cells by different mechanisms. This study was performed to evaluate the total phenols, flavonoids, and antioxidant activities of twenty-four propolis samples from different regions of Morocco. In addition, two samples were screened regarding the antibacterial effect against four Staphylococcus aureus strains. Gas chromatography coupled to mass spectra (GC-MS) analysis was done for propolis samples used in antibacterial tests. The minimum inhibitory and minimum bactericidal concentration (MIC, MBC) were determined. The potential to acquire the resistance after sequential exposure of bacterial strains and the impact of adaptation to propolis on virulence using the Galleria mellonella were evaluated. Additionally, the effects of propolis extract on the bacterial adherence ability and its ability to inhibit the quorum sensing activity were also examined. Among the twenty-four extracts studied, the samples from Sefrou, Outat el Haj, and the two samples marketed in Morocco were the best for scavenging DPPH, ABTS, NO, peroxyl, and superoxide radicals as well as in scavenging of hydrogen peroxide. A strong correlation was found between the amounts of phenols, flavonoids, and antioxidant activities. 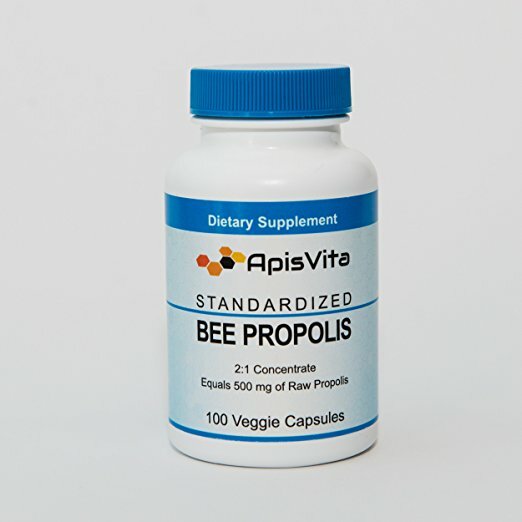 Propolis extract at the MIC value (0.36 mg/mL) significantly reduced (p < 0.001) the virulence potential of S. aureus ATCC 6538 and the MRSA strains without leading to the development of resistance in the sequence of continuous exposure. It was able to impair the bacterial biofilm formation. The results have revealed that sample 1 reduces violacein production in a concentration dependent manner, indicating inhibition of quorum sensing. This extract has as main group of secondary metabolites flavonoids (31.9%), diterpenes (21.5%), and phenolic acid esters (16.5%). 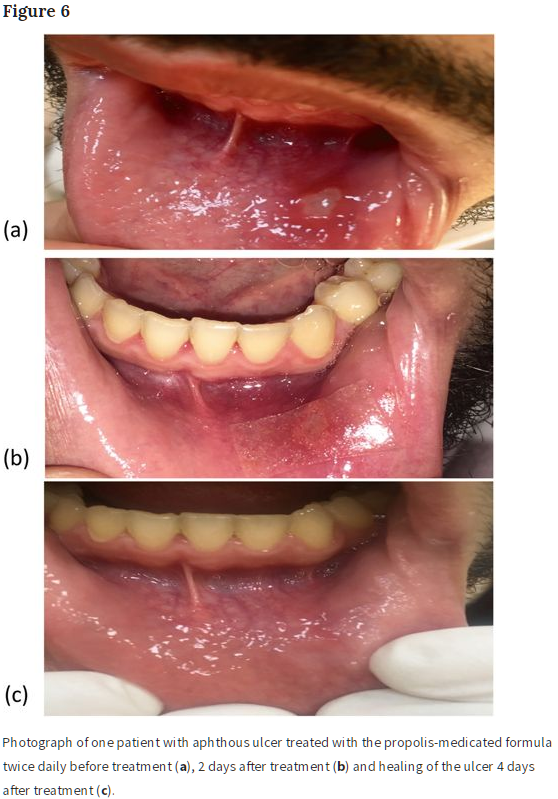 Oromuco-adhesive films for buccal delivery of Propolis extract (PPE) entrapped in niosomes, were prepared to treat oral recurrent aphthous ulcer (RAU). PPE was investigated for antimicrobial compounds. Niosomes composed of span60 and cholesterol were evaluated for particles size, polydispersity index (PDI), zeta-potential, entrapment efficiency and in vitro release. The formed oromuco-adhesive films containing niosomal PPE were evaluated for swelling, mucoadhesion and elasticity. 24 patients suffering from RAU were divided equally into medicated and placebo groups and participated in this study to examine the onset of ulcer size reduction, complete healing and pain relief. Ultra-performance liquid chromatography-high resolution mass spectrometry revealed the presence of pinocembrin, pinobanksin, chrysin and galangin as antimicrobial flavonoids with total content of 158.7 ± 0.15 µg quercetin equivalents and phenolic content of 180.8 ± 0.11 µg gallic acid equivalents/mg. Multilamellar niosomes of 176-333 nm displayed entrapment efficiency of 91 ± 0.48%, PDI of 0.676 and zeta potential of -4.99. In vitro release after 8 h from niosomal dispersion and films were 64.05% and 29.09 ± 0.13% respectively. Clinical results revealed duration of film adherence from 2-4 h in the two groups. The onset of ulcer size reduction in medicated group was attained within second and third day, complete healing was achieved within first 10 days of treatment and pain relief lasted for more than 4-5 h, in contrast to the placebo group. This oromuco-adhesive films which offer controlled and targeting drug delivery can be proposed as a new therapeutic strategy in the treatment of oral recurrent aphthous ulcer. Paenibacillus larvae (P. larvae) is a bacterial pathogen causing American foulbrood (AFB), the most serious disease of honeybee larvae. The food of young larvae could play an important role in the resistance of larvae against AFB. It contains antibacterial substances produced by honeybees that may inhibit the propagation of the pathogen in larval midguts. In this study, we identified and investigated the antibacterial effects of one of these substances, trans-10-hydroxy-2-decenoic acid (10-HDA), against P. larvae strains including all Enterobacterial Repetitive Intergenic Consensus (ERIC) genotypes. Its inhibitory activities were studied by determining the minimum inhibitory concentrations (MICs). It was found that 10-HDA efficacy increases substantially with decreasing pH; up to 12-fold differences in efficacy were observed between pH = 5.5 and pH = 7.2. P. larvae strains showed different susceptibility to 10-HDA; up to 2.97-fold differences existed among various strains with environmentally important ERIC I and ERIC II genotypes. Germinating spores of the pathogen were generally more susceptible to 10-HDA than vegetative cells. Our findings suggest that 10-HDA could play significant role in conferring antipathogenic activity to larval food in the midguts of young larvae and contribute to the resistance of individual larvae to P. larvae. 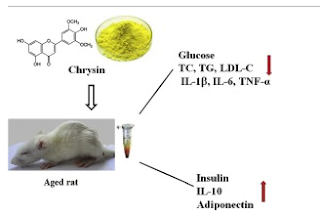 Chrysin attenuates inflammatory and metabolic disorder indices in aged male rat. Advanced age is a major risk factor for metabolic disorders. Accelerated inflammatory processes with increased age can contribute to the pathogenesis of metabolic disturbances. Chrysin is a natural flavonoid ingredient of honey and propolis. Chrysin has been effective in decreasing cholesterol and glucose levels preventing metabolic disturbances. The aim of this study was to evaluate the effects of chrysin against age-associated inflammation, hyperglycemia, and hypercholesterolemia. Male Wistar rats (2, 10, and 20 month-old) were intraperitoneally (i.p.) injected with chrysin (20 mg/kg) for 30 days. The findings showed elevated inflammatory cytokines, glucose, and lipid parameters in the sera of aged rats when compared with young ones. However, chrysin treatment ameliorated these alterations. Furthermore, chrysin reduced the levels of adiponectin, HDL-C, and insulin in 20 month-old rats. The current study showed that chrysin was effective in attenuating age-related lipid abnormalities, glucose elevation, and inflammation. Background: The goals of the current study were to address a new concept termed a health benefits' index (HBI) and to verify the type of correlation between the pricing of honey and its HBI/medicinal properties. Diverse types of honey from different origins and places were investigated for their antioxidant and antimicrobial activity. Methods: We have utilized a modified protocol of the DPPH assay for measuring free radical scavenging and the microdilution test for the determination of antibacterial/antifungal minimum inhibitory concentrations (MICs). MICs were determined against Staphylococcus aureus, Escherichia coli, Salmonella typhimurium, and Candida albicans microorganisms. Employing a "combined benefits approach" enabled us to attach to each honey type a unique number of HBI that correlate with honey health and medicinal values. Results: The various types of honey demonstrated significant but variable antioxidant, antibacterial, and antifungal activities. 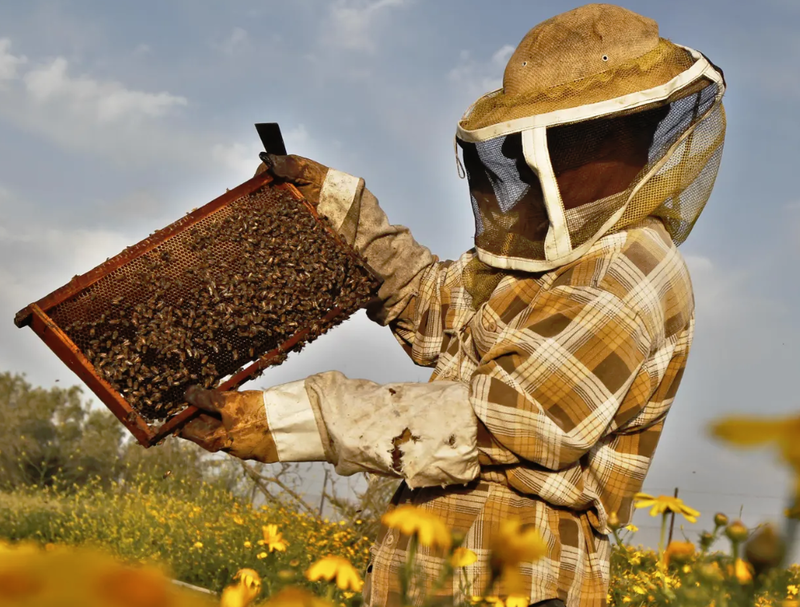 Types of wildflower-labeled honey were found to have a wide range of HBI values and medicinal properties, probably due to their containing different nectar contents/phytochemicals. Moreover, an inconsiderable correlation was detected between the market prices of different types of honey and their HBIs. Conclusions: The proposed index of health benefits could be recalculated/updated following measurement of more and more medicinal properties, such as anti-inflammatory, antidiabetic, and anticancer activities. This index could be used as an effective tool for consumers of honey to evaluate the real value of the purchased product. Anti-inflammatory drugs inhibit inflammation, particularly those classified as nonsteroidal anti-inflammatory drugs (NSAIDs). Several studies have reported that propolis has both anti-ulcerogenic and anti-inflammatory effects. 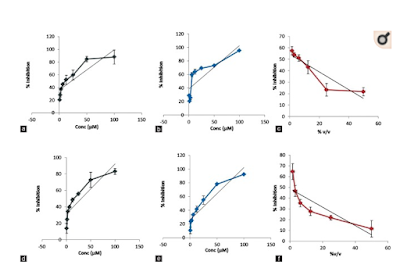 In this study, we investigated the bioactive compound and in vivo anti-inflammatory properties of both smooth and rough propolis from Tetragronula sp. To further identify anti-inflammatory markers in propolis, LC-MS/MS was used, and results were analyzed by Mass Lynx 4.1. Rough and smooth propolis of Tetragonula sp. were microcapsulated with maltodextrin and arabic gum. Propolis microcapsules at dose 25 - 200 mg/kg were applied for carrageenan-induced rat’s paw-inflammation model. Data were analyzed by one-way ANOVA and Kruskal–Wallis statistical tests. LC-MS/MS experiments identified seven anti-inflammatory compounds, including -dehydrogingerdione, alpha-tocopherol succinate, adhyperforin, 6-epiangustifolin, deoxypodophyllotoxin, kurarinone, and xanthoxyletin. Our results indicated that smooth propolis at 50 mg/kg inhibited inflammation to the greatest extent, followed by rough propolis at a dose of 25 mg/kg. SPM and RPM with the dose of 25 mg/kg had inflammatory inhibition value of 62.24% and 58.12%, respectively, which is comparable with the value 70.26% of sodium diclofenac with the dose of 135 mg/kg. This study suggests that propolis has the potential candidate to develop as a non-steroid anti-inflammatory drug. Our understanding of gut health has ballooned as we've learned more about the communities of beneficial bugs that live within each of us. We now know this microbiome contributes to everything from immunity and obesity to mental health. Now scientists suspect microbes might also be what gives one of New Zealand's most lucrative exports, manuka honey, its active ingredient. The native manuka plant acts as the substrate for the unique and valuable honey, which contains high levels of a compound called methylglyoxal. This is better known to consumers around the world by the different systems that producers use to grade manuka honey – MGO or unique manuka factor, or UMF. Methylglyoxal is formed from nectar rich in a substance called dihydroxyacetone, or DHA. "We do not yet understand why some flowers on some manuka plants produce high levels of DHA and wonder if the micro-organisms in the flowers might contribute to this," said Dr Hayley Ridgway, a senior scientist at Plant & Food Research. "Our previous work has shown that manuka is a plant for which microbes significantly impact growth and chemistry. We also know that DHA can be made by micro-organisms." 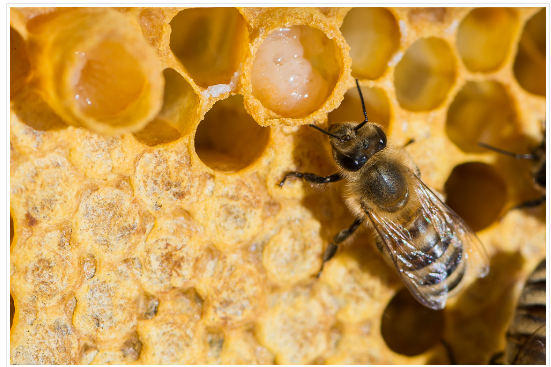 Bee venom has been reported to demonstrate antinociceptive and anti-inflammatory effects in experimental studies, but there remain questions regarding the clinical use of bee venom, especially for scleroderma. 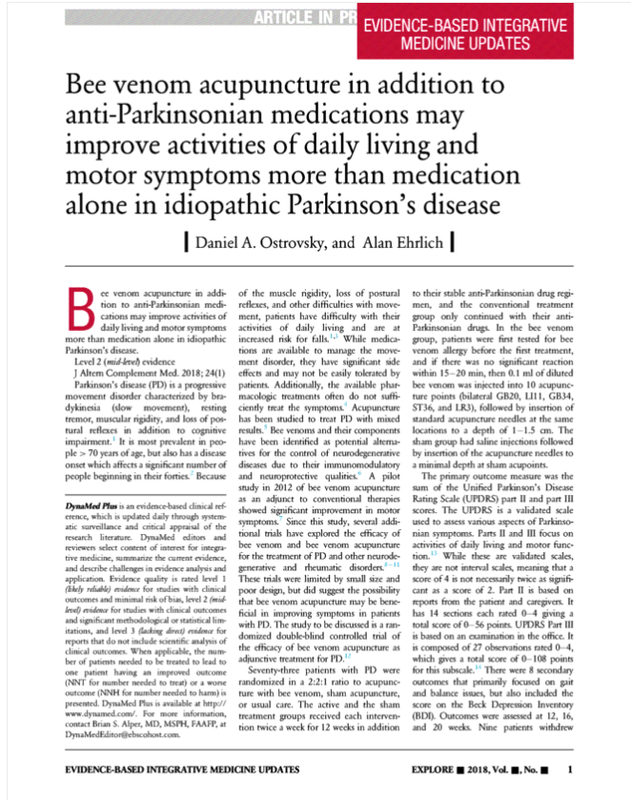 This case report shows the successful outcome of bee venom acupuncture for circumscribed morphea in a patient with systemic sclerosis, which is considered to be a rare condition. A 64-year-old Korean woman had circular white areas (3 and 1 cm diameter) with severe itch in the right lateral iliac crest. Based on an initial diagnosis of systemic sclerosis (1 year prior to presentation at our clinic), she had been treated with painkillers, steroids, antitussive expectorants, and aspirin, with minimal effect on her recent skin symptoms. 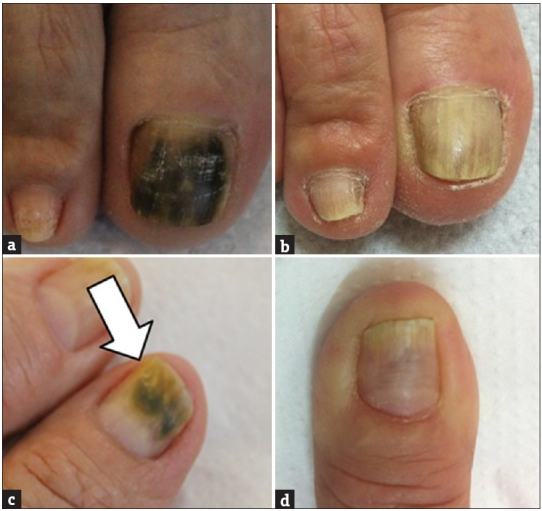 In this study, the diagnosis of circumscribed morphea was based on localized skin symptoms of the patient with systemic sclerosis. The patient visited Gachon University Korean Medical Hospital for treatment of topical skin symptoms. After being evaluated for bee venom compatibility, she was administered subcutaneous bee venom acupuncture along the margins of the patches (superficial circumscribed lesions) using the shallow surround needling method twice per week for 1 week and then once per week for the following 3 weeks. Itch levels were evaluated before each treatment session: by her second visit, her itch had decreased from 8 to 3 on a 10-point numerical rating scale; by her sixth visit, her itch had decreased from 3 to 0. She did not experience adverse effects, and these improvements were maintained until the 2-month follow-up evaluation. Bee venom treatment demonstrates the potential to serve as an effective localized therapy for circumscribed morphea. 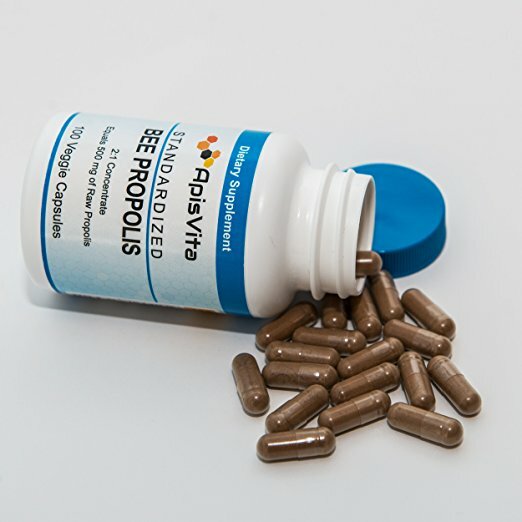 Propolis is a generic name for a biological substance produced by bees used for multiple purposes in folk medicine. Propolis special extract GH 2002 is crude propolis highly purified by a special procedure and freed from the accompanying substances like pollen, wax, resins. The cytotoxic and antiherpetic effect of propolis extracts against Varicella zoster virus (VZV) was analysed in cell culture, and revealed a moderate cytotoxicity on lung fibroblasts with a CC50 of 380 μg/ml. The 50 % inhibitory concentration (IC50) of GH 2002 propolis extract for VZV plaque formation was determined at 64 μg/ml. The propolis extract exhibited high levels of antiviral activity against VZV in viral suspension tests, infectivity was significantly reduced by 93.9 % and a direct concentration-dependent antiviral activity could be demonstrated. In order to determine the mode of virus suppression by propolis, the extract was added at different times during the viral infection cycle. 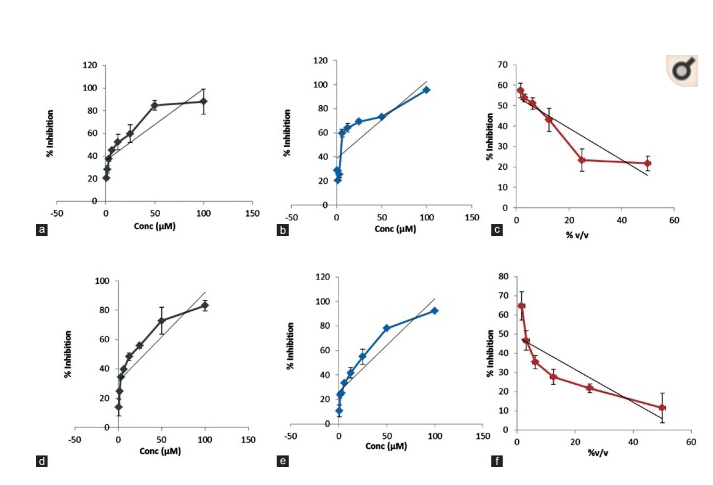 Addition of propolis to uninfected cells (pretreatment cells) prior to infection or to infected cells (replication) during intracellular replication had no or only minor effect on virus multiplication. However, propolis exhibited high anti-VZV activity when viruses were pretreated with propolis prior to infection thus indicating an unspecific interaction between the virus and propolis. The antiviral activity is comparable to acyclovir. Helicobacter pylori (H. pylori) has been introduced by since 1983 by Marshal and Warren to play the main role in the pathophysiology of gastritis and gastric ulcers. Almost half of the world population1 is infected by H. pylori. Current therapeutic regimen against H. pylori includes the use of a proton pump inhibitor plus two or more antibiotics. However, the efficacy of this regimen is decreasing mainly due to antibiotic resistance and side effects of medications. This fact has resulted in public interest in other therapeutic options and the role of probiotics merits special attention in this regard. This study aims to evaluate the efficacy of honey-derived Lactobacillus rhamnosus on H. pylori-induced gastric inflammation and gastro-intestinal infection in C57BL/6 Mice. The 24 C57BL/6 Mice were randomly divided into three groups of eight mice each. All the mice were fed with 1cc suspension containing 5*1010 CFU/ mL of ATCC43504 strains of H. pylori for 3 consecutive days, twice daily via polyethylene gavage tubes. At the end of 4th week, infection with H. pylori was confirmed with stool Ag (ELISA) and following sacrifice of one mouse from each group, histopathologic study confirmed gastritis. The groups were subjected to different therapies as stated, 1: without Bismuth (Bi), Omeprazole (Om) and L. rhamnosus prescription, 2: Bi, Om and Clarithromycin (Cl) and 3: Bi, Om plus 1cc of suspension of 109 CFU/mL of L. rhamnosus. 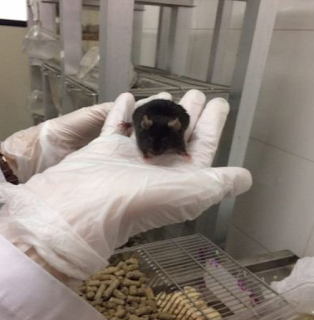 After 2 weeks, the stool was analyzed for Ag and the mice were sacrificed for evaluation of histopathologic changes. Treatment with L. rhamnosus group provided Zero titer of stool Ag and was associated with improved gastric inflammation in all subjects, similar to the clarithromycin group. Honey-derived L. rhamnosus probiotics provides similar results as clarithromycin in terms of improvement of H. pylori infection and gastritis in C57BL/6 Mice model, without its cons of antibiotic resistance. Alternative medicine is a growing industry in Mexico. Ancient remedies can provide natural ways to treat illnesses, while allowing Mexicans to connect to their heritage. CGTN’S Alasdair Baverstock reports on a the growing popularity of bee therapy. Apitherapy is the treatment of illness with products that come from honeybees, particularly their venom, and in Mexico, it’s very popular. 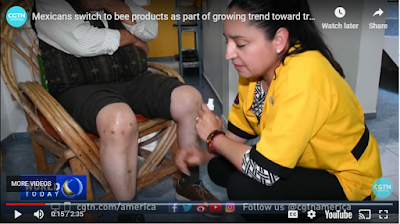 Estimates suggest some 60 percent of Mexicans are proponents of indigenous medicine, and where there’s honey being produced, there are bee sting clinics. Leticia Solis works in one such facility. She’s trained and certified by the Mexican apitherapy association. Leticia’s patients suffer from various ailments, but all claim the treatment has helped. Introduction: Antibiotics that suppress Propionibacterium acnes are the standard treatment for acne but are becoming less effective, due to the appearance of antibiotic-resistant strains. Many plants are known to have innate antimicrobial action and can be used as alternatives to antibiotics; thus, it is necessary to prove their effectiveness in vivo. This study aimed to evaluate the anti-acne efficacy of a new cream based on three natural extracts, comparing it to erythromycin cream and placebo. Patients and methods: Sixty patients with mild to moderate acne vulgaris were randomly divided into three groups: treated with cream containing 20% propolis, 3% “tea tree oil”, and 10% “Aloe vera” (PTAC) (n=20); or with 3% erythromycin cream (ERC) (n=20); or with placebo (n=20). At baseline, after 15 and 30 days, investigators evaluated response to treatment by counting acne lesions through noninvasive measurements and macro-photography. Results: All the clinical and instrumental values studied were statistically different from placebo except for sebometry, pHmetry, and erythema index values, measured on healthy skin. Unlike in the placebo group, papular and scar lesions showed high erythema reduction after 15 and 30 days of PTAC and ERC application. Conclusion: The PTAC formulation was better than ERC in reducing erythema scars, acne severity index, and total lesion count. This study assessed the effects of propolis alone or combined with insulin on maternal status, pregnancy outcomes and placental oxidative stress in streptozotocin-induced diabetic rats. Forty female rats were randomly assigned into five groups (n = 8/group) i.e. non-DM (non-diabetes), DM (diabetes), DM + Propolis (diabetes on propolis orally); DM + Insulin (diabetes on insulin subcutaneously) and DM + Combined (diabetes on propolis and insulin) groups. Propolis and insulin were given at 300 mg/kg/day orally and 5.0 IU/kg/day subcutaneously, respectively, for 4 weeks. Fasting blood glucose, conception period, implantation losses, foetal blood glucose and placental oxidative stress markers such as malonaldehyde and protein carbonyl were significantly higher while maternal weight gain, foetal body weight and total antioxidant capacity were significantly lower in DM group compared with non-DM group. These changes were significantly improved in rats treated with propolis or insulin alone with greater significant effects in rats treated with both propolis and insulin. This study may suggest the protective effects of propolis against DM-induced impaired pregnancy outcomes and placental oxidative stress with greater effects when combined with insulin. ...In conclusion, this study may suggest the protective effects of propolis against DM-induced impaired pregnancy outcomes and placental oxidative stress with greater effects when combined with insulin which could be partly due to the synergistic effect of some of its phytochemical constituents. Apart from supporting the traditional belief on the beneficial effect of propolis on health, further studies are suggested to determine its molecular mechanism of action and its possible role in protecting or reducing complications of DM in other organs. In our in vitro experiments, PE was able to inhibit Candida spp. like other cases in the literature. In vivo, four nails were treated with PE of which two of them showed complete resolution. Culture was negative. The other two nails showed a reduction of over 50% of the lesion; however, fungi were still isolated. Based on the results obtained during in vitro studies as well as results obtained from tests performed after topical treatment, it can be concluded that propolis possesses antifungal potential and is a promising therapeutic option in cases of onychomycosis. From the past five decades, metronidazole and tinidazole have been used for treating nonresistant and resistant giardiasis and trichomoniasis. However, due to the occurrence of drug resistance to standard therapy idealizes us to explore some additional therapies which is cost-effective, easy accessibility, and natural which has least side effects. Manuka honey obtained from Leptospermum scoparium is well known for its antibacterial and wound healing properties and is thought to be a better option as an additional therapy. The present study was conducted to find out the effect of manuka honey on anaerobic protozoans that includes Giardia and Trichomonas under in vitro conditions in comparison to metronidazole and tinidazole. Axenic culture of Giardia lamblia strain Portland 1 and Trichomonas vaginalis strain 413 was used for drug sensitivity assay to tinidazole, metronidazole, and manuka honey with the highest concentration of 17.1 μg/ml, 24.7 μg/ml, and 50%v/v by using (3-(4,5-Dimethylthiazol-2-yl)-2,5-diphenyltetrazolium bromide, a tetrazole). For this, head-to-head comparison has been done and IC 50 of the standard drug as well as manuka honey was calculated. The result showed that percentage inhibition on the growth of both the parasites is dependent on concentration as well as exposure time of the drug. The calculated IC 50 was found to be 5.6%v/v and 1.5%v/v for manuka honey with respect to G. lamblia and T. vaginalis. The present study suggests that manuka honey can be used as an additional therapy for the patient with giardiasis or trichomoniasis. However, in vivo study in the near future will elucidate more about the effectiveness of honey in treating parasitic infections. 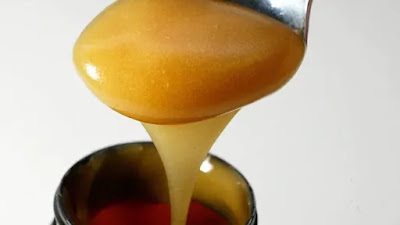 Honey as a Treatment in Otorhinolaryngology: A Review by Subspecialty. To provide an up-to-date review of honey's effectiveness and potential applications in otorhinolaryngology. A literature search of the online databases PubMed, EMBASE, and Cochrane Central Register of Controlled Trials was conducted. Sixty-three studies were identified within head and neck surgery (n = 23, 36%); pediatric otolaryngology (n = 18, 29%); rhinology, sinus, and skull base surgery (n = 11, 17%); otology (n = 6, 10%), facial plastic and reconstructive surgery (n = 3, 5%); and laryngology (n = 2, 3%). Studies included 6 meta-analyses, 44 randomized control trials, 5 case reports, and 8 animal models or in vitro studies. Of 55 clinical studies, 50 reported Level 1 evidence (prospective randomized control trials), and 5 reported Level 4 evidence (case series). The evidence level by subspecialty was: head and neck surgery (Level 1 n = 23), pediatrics (Level 1 n = 18), rhinology (Level 1 n = 7, level 4 n = 1), otology (Level 1 n = 1, Level 4 n = 3), facial plastics and reconstructive surgery (Level 4 n = 1), and laryngology (Level 1 n = 2). Honey can be used for a variety of otolaryngology conditions. The highest quality meta-analyses support oral honey for prevention and treatment of oral mucositis in cancer patients, cough associated with upper respiratory infection in children, and pain control after tonsillectomy. Further research will likely justify broader applications. Apply the propolis to the affected area. Cover the wart with a cotton pad. In the wild, bee propolis protects beehives against infections and has antiviral properties and action of antibiotic. Found that propolis activates volochkovu gland and stimulates the immune system. Physicochemical characteristics, main minerals, and antioxidant activity were determined for Palestinian honey samples belonging to different floral and geographical origins. The features of the analyzed samples were within the established international standards for honey quality control. One clear exception was the hydroxymethylfurfural (HMF) of the Ziziphus sample purchased from the Jericho region, which is the lowest city in the word characterized by a hot desert climate. The observed HMF value was 81.86 ± 2.64 mg/kg being two folds the maximum allowed in honey samples (40 mg/kg). As a second objective of the present work, the parameters were divided into two groups with different discriminatory power. The assessed physicochemical parameters, and the antioxidant activities, specific to the botanical origin discrimination, were used to run the first PCA. A strong correlation could be seen between the bioactive compounds and the antioxidant activities despite the geographical origin of the samples. Thyme and Ziziphus samples were the best samples, while citrus sample presented the lowest activity. Regarding the geographical discrimination, Ash and mineral contents in addition to the electrical conductivity were used. The output PCA conserved high represent ability of the data in the two-first components being 82.72% and 9.60%. A little discrimination between the samples produced in the north and those produced in the south of the country, but it was not perfect. The intervention of the botanical variability could be the reason. Current study was designed to investigate the protective effects of royal jelly on Flunixin me- glumine (FM)-induced spermiotoxicity related to sperm concentration, abnormal spermatozoa count and histopathological changes in mice testis. The subjects were divided into five groups according to FM and/or royal jelly intake: Control group; group 1, FM alone (25 mg/kg, im); group 2, combination of FM (25 mg/kg, im) and royal jelly (200 mg/kg, oral); group 3, FM alone (50 mg/kg, im); and group 4, combination of FM (50 mg/kg, im) and royal jelly (200 mg/kg, oral). The animals were fed once daily for 15 days and they were sacrificed last day. Epididymal sperm concentration and abnormal spermatozoa count were noted. Testicular histological findings were evaluated. On purpose, organization of each animal was graded according to Johnsen's scoring to assess the spermatogenesis relying on seminiferous tubule cross-section scores. Comparing to controls, FM administration caused a decrease in sperm concentration (p⟨0.05), an increase in total abnormal spermatozoa rates (p⟨0.05) and more degenerative changes in testes in mice. Royal jelly supplementation ameliorated both sperm concentration and abnormal spermato- zoa (p⟨0.05) comparing to the control group. In conclusion, we suggested that royal jelly might have protective effects in the FM-induced reductions in epididymal sperm concentration and in- crease in abnormal spermatozoa rate. Caffeic acid phenethyl ester (CAPE) is a major propolis component that possesses a variety of pharmacological properties such as antioxidant and anticancer effects. Herein, we investigated the effectiveness of CAPE on cytotoxicity of clinically used anticancer drugs, doxorubicin (DXR) and cisplatin (CDDP), in parental and the drug-resistant cells of stomach (MKN45) and colon (LoVo) cancers. Concomitant treatment with CAPE potentiated apoptotic effects of DXR and CDDP against the parental cells. The treatment significantly reduced the production of reactive oxygen species elicited by DXR but did not affect the DXR-mediated accumulation of 4-hydroxy-2-nonenal, a lipid peroxidation-derived aldehyde. Intriguingly, treatment of parental MKN45 cells with CAPE alone reduced 26S proteasome-based proteolytic activities, in which a chymotrypsin-like activity was most affected. This effect of CAPE was the most prominent among those of eight flavonoids and nine cinnamic acid derivatives and was also observed in parental LoVo cells. In the DXR-resistant or CDDP-resistant cells, the chymotrypsin-like activity was highly up-regulated and significantly decreased by CAPE treatment, which sensitized the resistant cells to DXR and CDDP. Reverse transcription-PCR analysis showed that CAPE treatment led to downregulation of five proteasome subunits (PSMB1-PSMB5) and three immunoproteasome subunits (PSMB8-PSMB10) in DXR-resistant MKN45 cells. The results suggest that CAPE enhances sensitivity of these cancer cells and their chemoresistant cells to DXR and CDDP, most notably through decreasing proteasome function. Thus, CAPE may be valuable as an adjuvant for DXR or CDDP chemotherapy in gastric cancer. Bee venom acupuncture in addition to anti-Parkinsonian medications may improve activities of daily living and motor symptoms more than medication alone in idiopathic Parkinson's disease.